The day is finally here where I could start sharing my experiences from the amazing South African city of Cape Town! My cousin Alexie of Travels with Lexy and her boyfriend Mikey are currently living in Cape Town for a few months, so I was super excited to go visit them and explore beautiful beaches, go on unique adventures and eat amazing cuisine. I left for South Africa on a Saturday morning and survived the 14-and-a-half hour flight to Johannesburg and then another 2 hours to Cape Town. Even though it was a long journey, I was super excited to explore a new city, country, continent and hemisphere! Since I was in Cape Town for 10 days, I thought I would split up this blog post for you all so that you could thoroughly read, enjoy and live through my favorite adventures of the trip! Today, I am thrilled to share why I fell in love with the city’s breathtaking and unique beaches and waterfront areas. Enjoy! Now, it’s time for the beach! If you know me well or have been keeping up with my blog posts, it is pretty clear that I am definitely a beach person. 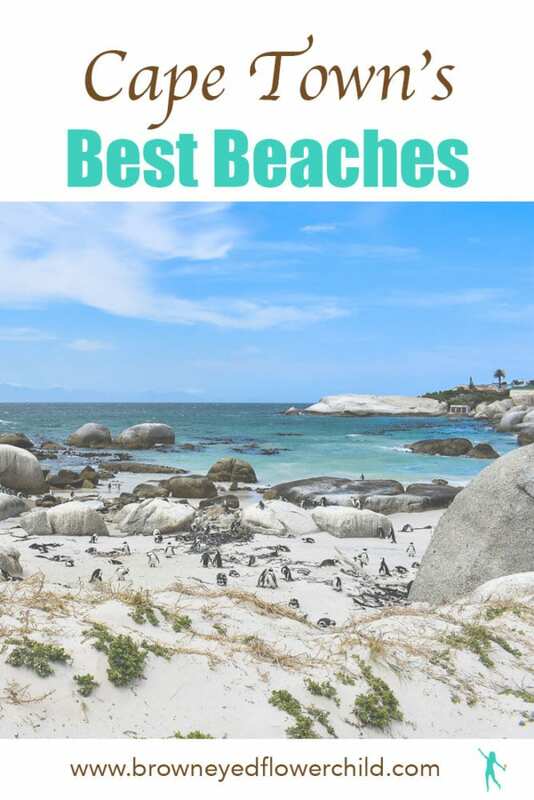 I have been to some pristine beaches in this world and Cape Town definitely offers some of the best! Get ready to learn more about these amazing seashores. Located in the most affluent area of Cape Town, Clifton offers four scenic beaches along the Southern Atlantic Ocean. What is cool to know is that each of these beaches attracts a different crowd. 4th Beach, the beach we stayed at, attracts families and people in their 20s and 30s; 3rd Beach is popular with Cape Town’s LGBT community; 2nd Beach is where you can spot models and Cape Town’s rich and famous and then 1st Beach is where you can bring your dog. The ocean water at Clifton Beach is a glistening crystal blue, but don’t assume that it is tropical water because it is absolutely freezing! Since February in South Africa is equivalent to New Jersey’s August, I thought that the ocean water would have been bearable enough to swim in. After walking along the coastline and getting my feet wet, they were numb before I even knew it – that is how cold the water was. So sadly, I didn’t get my swimming time in during this trip, but it’s okay because I still got to enjoy the warm sun and gorgeous views of this beach. Clifton Beach is mainly residential, but you could still find high-end restaurants and cafés in the area. For all of you that have been waiting for it, Boulders Beach is where you can find the famous South African PENGUINS! Located 45 minutes to an hour from the heart of Cape Town, Boulders Beach is a beautiful area made up of fresh white sand and inlets between granite boulders. Oh and did I mention penguins?! Yes, this beach is definitely the pearl of the city because of these adorable and happy guys. Boulders Beach is located in Simon’s Town, which offers a downtown area with adorable cafés, boutiques, restaurants and cliffside homes. The beach area is beautiful, but I will be honest that because of these oh-so-cute penguins, it could be a tourist trap. So it is important to find the perfect areas to get your alone time with the penguins and to snap some outstanding photographs. When I first got to Boulders Beach, I was directed to walk along a hidden boardwalk to the information center. The boardwalk is long and crowded, but offers beautiful views of the mountains, cliffs and beach and it even has woodland paths with floral touches. Even though the dock is where you could see the penguins in masses, you have to actually go on the beach to get close-up views of these little guys. Even though the penguins are adorable, please keep in mind though that you cannot pet them because they do bite! Plus you want to maintain respect for the penguins as you are entering their home. The last thing you want to do is get these happy birds scared or nervous. On the other side of the dock is the beach area where you could walk on the sand and get closer to the penguins. Since Boulders Beach attracts hundreds of people a day, it is hard to find an area where you could get great views of the penguins. In that case, there are little alleyways between the boulders where you could crawl through and find the penguins hanging out with their fellow chaps. One thing you have to keep in mind when you crawl through the boulders is that it can close off and get dangerous when high tide comes in. However, when it is low tide, it is a great area to escape the crowds and get some cool “selfies” with the penguins. Since Boulders is a far drive, I definitely recommend grabbing lunch either in Simon’s Town or at Boulders Beach Restaurant, located right on the beach! Before I hauled an Uber back to the main part of the city, I decided to relax and enjoy a lunch with a view right at Boulders. I got a delicious mussel dish in a creamy garlic broth with a glass of South African rosé. It definitely hit the spot! Just a little further from Clifton Beach (the beach I first talked about) is Camps Bay. This scenic beach is more of a “public” beach in a sense that it is easier to access (Clifton Beach has steep stairs to get to the coast). Camps Bay offers a famous strip that features a range of glitzy restaurants, high-end boutiques and fun nightspots. My cousin Alexie and I ate an amazing seafood lunch at Paranga Restaurant, facing the ocean. I had the most amazing crawfish right from the shells; it was definitely one of my top meals in South Africa. There are a lot of great gems at Camps Bay Beach. My favorite part of the beach is where you could walk on the rocks and watch the ocean crash along them. The other view from the rocks is the overpowering Twelve Apostles from Table Mountain. I loved how the clouds were covering the 12 peaks of the mountains; it was a beautiful site! Around a half hour from the heart of Cape Town is the iconic (and super colorful) beach of Muizenberg. As a largely kept secret to Cape Town, Muizenberg attracts very few tourists and is known as being one of South Africa’s most active surfing communities amongst locals. Muizenberg beach is one of the perfect spots in the Cape Town area to catch a sunset and it even offers a great downtown area with delicious restaurants, bars, shops and colonial history! In addition to beautiful beaches, the city of Cape Town has two awesome waterfront locations with 5-star dining, posh rooftops overlooking the sea, authentic South African stores, high-end hotels and so much more. As South Africa’s most-visited destination, Victoria & Alfred Waterfront (V&A Waterfront) offers spectacular views of the bay and the iconic Table Mountain. As one of the top destinations in the continent to go shopping, V&A Waterfront is divided up into five shopping districts: Victoria Wharf, The Watershed, The Alfred Mall and Pierhead, The Clock Tower and Breakwater Point. You can even find authentic African art, jewelry and home goods in this area! A great place to get traditional African goods is at the African Trading Port! I love how pretty the building is and I also bought a few souvenirs for my family. As you shop and enjoy the beautiful weather, V&A Waterfront offers live entertainment, great coffee shops and gelato stands, fun drinking spots, a Ferris Wheel that provides 360-degree views of the city and mountains and a special monument of Nelson Mandela and a few other South African role models. The oceanfront district of Sea Point is a lively area that features luxury apartments, a sandy beach, gorgeous tidal pools, a scenic promenade, views of Lion’s Head and amazing options for all of my fellow foodies. The main attraction in Sea Point is the thriving Mojo Market – a fairly new foodie and lifestyle market that offers an eclectic mix of food vendors and retail stalls. I seriously LOVED Mojo Market because there are so many different options to choose from and they also have cute lit-up signs and fun places to sit and enjoy your meal of choice. Book Your Next Big Adventure to Cape Town, South Africa! I hope you all enjoyed reading my first blog post on Cape Town’s beaches and lively waterfronts. You too could experience the fun I had through **TripAdvisor. Email me at TAYLORL.DEER@gmail.com, contact me via social media or comment below if you have any questions about my trip. Wondering how I find cheap international flights? **Click here ! Shop my outfits with the LIKEtoKNOW.it app, @brown.eyed.flower.child. Stay up to date with my adventures and current offerings!